Hank's adventures cooking in school. Hank Zipzer can't wait for his schools's Multi-Cultural Day Lunch - no reading, no writing, just cooking! Holy enchilada! Did he accidentally use three cups of chilli powder?! 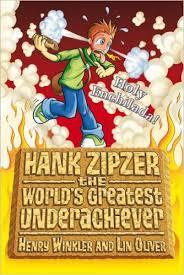 Inspired by the true life experiences of Henry Winkler (The Fonz in 'Happy Days'), whose undiagnosed dyslexia made him a classic childhood underachiever, the Hank Zipzer series of 10 books is about the high-spirited and funny adventures of a boy with learning differences. Read about Hank's adventures playing Baseball. Read about Hank's adventures in Science Class. How can Hank put off his parent-teacher meeting? Hank is making things very scary for Halloween. Hank's adventures in Summer School. Hank's adventures on a School Field Trip.